The SRX-Pro U3-series NVR Servers are designed to meet the performance and storage requirements of enterprise video surveillance deployments. Front-accessible, high-capacity hard drive storage ensures always-on recording, and provides for future storage expandability, while enterprise-class hard drives ensure maximum reliability and speed. The U3-series NVR server is able to support up to 80TB of video storage. Additional storage can be achieved with external storage devices (sold separately). Rack mountable 3U chassis is designed for easy rack installations, while updated chassis design facilitates optimal internal air flow for added Server longevity and reliability. The powerful Intel XEON CPU allows the NVR to harness the on-board video capabilities of its DFI industrial motherboard, with versatile DVI-I and HDMI ports available for local viewing. i3 International's superior SRX-Pro Server software is pre-installed and pre-configured for a plug-and-play experience. Software licensing is completely customizable to meet each customer's unique needs: from video security to intelligent video data analysis. The U2 rack mount is made for durability. Its long life cycle industrial motherboard is one of the key features. The U2 is a 2U size rack mount and it is designed to handle multiple IP cameras and long data retention: it comes with 3 bays of hard drives. Each bay can maximize to 10TB making it an 30TB system. The Operating System comes on a solid state hard drive running Window 7 Embedded. Running on Intel Chipset i5, the U2 powers all its components with a 400W power supply. The 2 NICs allow the U2 to connect to a local switch such as i3's S243 or S81 for multiple IP cameras and the other NIC to the Internet without impeding your network. For video backup use the slim DVD recorder or the USB (on the front panel) for easy to use memory stick storage. U2 is built to run i3's SRX-Pro software; it is designed as a more compact chassis and a replacement of the 4i series server. If more hard drives or longer retention of recording capacity is required the U2 can also fully integrate with i3's external hard drive devices (iS316). The U1 is a cost effective network video recorder (NVR) that has built-in Power-over-Ethernet (PoE) switch capabilities able to support 16 IP cameras, eliminating the need, and therefore the cost, of an additional external switch. The U1 is a complete, robust NVR with Windows 7e operating system. As an option, two hard drives are available to a maximum of 6TBs of hard drive space for video recording. The U1 runs i3's Core version of the SRX-Pro software that enables CPU to easily handle the extensive functions and features of the software. The U1 has a video output for both a VGA monitor and the latest HDMI monitors. It has a separate network integration card for an external IP connection for remote connections and viewing utilizing i3 VPC. When it comes to support and services, the U1 comes with a solid 3 year parts and 1 year labor warranty excluding the hard drives. The U1 is designed to be fully monitored by CMS (Cloud Managed Services) with a real-time health status on the system. The user can receive emails or go online to see the U1 status at anytime from anywhere. this way either the CD-ROM drive or eSATA port must be disconnected. 3's Ax67R2 megapixel IP camera features 3MP video resolution with 4mm built-in lens. This camera delivers triple streaming performance and supports H.264 and JPEG video compression. H.264 codec allows for faster and more efficient video transmission over the network. 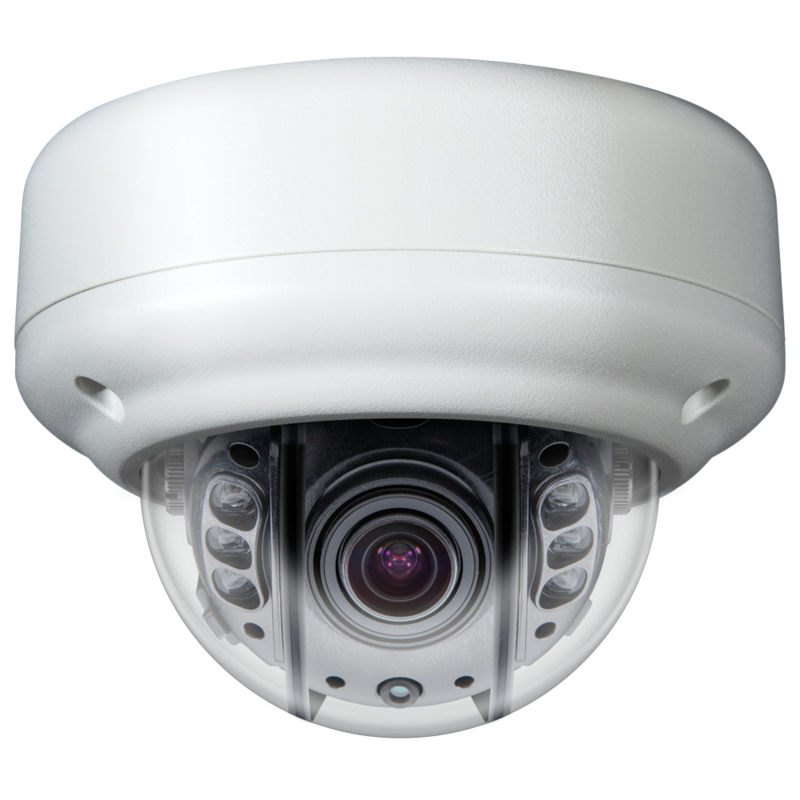 This dome camera comes with digital Wide Dynamic Range (WDR), a feature that allows the cameras to adjust to varying outdoor lighting conditions and provides the best video quality despite the presence of high and low exposure areas in the camera's lens view. Ax67R2 camera requires PoE power and come with the Day/Night capability. The Ax67R2 camera is very versatile and offers many practical functions ideal for both indoor and outdoor application, such as Smart IR. This moisture-, dust- and vandal-resistant camera is IP67-certified and IK10-compliant and comes in an aluminum casing, which makes it suitable for outdoor conditions, while also being perfect for the indoor installations. Corridor view is available for users that would like to view a hallway or a single store aisle. The Ax62V 3 MP IP dome provides the crystal-clear 16:9 full HD video for indoor applications in both day and night. The Ax62V employs a 1/3-type HD CMOS sensor providing excellent high definition picture quality with superb high sensitivity mode capabilities. Incorporated within the module are a host of security orientated features, including Wide Dynamic Range technology; Day/Night function and unique digital noise reduction. In addition, the camera includes other key features such as H.264 compression standard. The Ax62V is designed to save installation time as mounting adapters for various environments are no longer needed. The Ax78R 6MP provides 4 simultaneous, independently controlled digital pan-tilt-zoom (ePTZ) video streams, which may be recorded or viewed live as well as a built-in microphone and speaker allowing two way communication. This camera allows viewing video via standard web browser with no software required. Users of SRX-Pro software will be able to view and control all four video streams in SRX-Pro Server, SRX-Pro Remote and Video Pilot Client. Only one IP license is required to support all four video streams. The Ax78R camera has no moving parts, reducing maintenance costs. This camera comes with the full 360 degree field of view so fewer cameras are required to cover any facility with minimal blind spots. Perfect for both indoor and outdoor installations, the (digital) wide dynamic range function of this camera series helps achieve superb image quality with for even the most challenging environments. Built-in microphone and speaker allow for the two-way audio communication between the SRX-Pro Server site and the camera installation site, while microSD support allows for 'edge' video recording in case of the network failure. i3's HD-over-Coax AM52RM camera is designed to use existing coaxial cable infrastructure, while providing exceptional HD image, comparable to megapixel IP cameras. AM52RM offers incredible 1080P video resolution when used in combination with HR16. The additional advantage of the AM52RM is the acceptable coaxial cable distance, which can reach 750 feet, compared to no more than 300 feet CAT5e network cable distance recommended for IP cameras. This true day/night camera comes with a 2.8 to 12mm motorized varifocal lens, which can be controlled through the camera's built-in OSD menu, through IE interface of the i3 encoders/standalone DVRs, or through SRX-Pro Server. Ax52RM comes with a built-in Smart IR which achieves superior images in low-light condition by automatic LED brightness adjustment depending on the object's distance. This moisture-, dust- and vandal-resistant camera is IP66- and IK10-rated, suitable for both indoor and outdoor installations. The versatility of AM52RM IP camera makes it ideal for a range of video surveillance applications. Best suited for use with the i3's NVR in conjunction with HR16, the analog encoder. Budget-friendly meets the top-of-the-line. The CE-BZ0HDL comes loaded with many premium features like Autofocus, 30 fps WDR, four high-intensity IR LEDs and DC12V/AC24V all at a price that won’t exceed even the smallest of budgets. End users upgrading from an Analog based system will marvel at the full HD 1080p resolution while retaining their coax infrastructure with EX-SDI 2.0 technology. Installers will love the ease of focusing with the built-in 2.8~8mm autofocus lens and the ability to make OSD adjustments with Up the Coax Control (UCC). Choose the CE-BZ0HDL for price-sensitive applications that demand top-of-the-line quality. The S81 is a next generation L2 Managed PoE switch offering a full suite of L2 features, additional RJ45/SFP uplink connections, better PoE functionality and usability including advanced L3 features such as Static Route. This switch is made for megapixel IP Camera installations using high performance Gigabit Power-over-Ethernet (PoE). The S81 delivers 8 (10M/100M/1G) RJ45/PoE/PoE+ ports plus 2 RJ45 SFP combo ports and one RJ45 console port. All the RJ45 ports support automatic MDI/MDI-X operation, auto-negotiation and IEEE 802.3x auto-negotiation of flow control, so the optimum data rate and transmission can be selected automatically. The S242 supports PoE+ and provides up to 30 Watts per PoE Port. The 370 Watts of PoE power budget makes it ideal for 24 IP cameras. It has power-saving features like power scheduling and PoE configuration and helps to reduce power consumption with Energy Efficient Ethernet (IEEE 802.3az) features. The S242 provides 24 (10M/100M/1G) RJ45/PoE/PoE+ ports plus 4 10GbE SFP+ ports and one DB9 console port. It delivers high hardware performance and environment flexibility for businesses of all sizes. The S242 performs a wire-speed, non-blocking switching fabric. This allows wire-speed transport of multiple packets at low latency on all ports simultaneously. The switch also features full-duplex capability on all ports, which effectively doubles the bandwidth of each connection. The S242 can also be managed over the network with a web browser or Telnet application. The switch includes a built-in network management agent that allows it to be managed in-band using SNMP or RMON (Groups 1, 2, 3, and 9) protocols. It also has DB9 console port connector on the rear panel for out-of-band management. i3 utilizes POS systems to provide comprehensive and actionable information. All popular POS systems will interface to provide analytics, including exhaustive exception reporting. The system integrates with transaction data from other sources offering powerful capabilities beyond other POS exception reporting systems. i3 also negates the need for redundant systems by combining this capability with other in-store functions like traffic counting, thus providing cost savings on capital expenditures and ongoing maintenance. The Video Pilot Client (VPC) is i3’s highly versatile remote client software notable for its fast connection and unique Graphic User Interface (GUI). Parts of GUI are displayed only on user demand, which helps utilize more screen space for live or recorded video viewing. Users can view the video either in high definition or VGA mode. VGA mode offers smoother video, while HD provides clearer video as required for identification purposes. To prevent dropped connections and slow video transmission, VPC will automatically switch into sub-stream display when low bandwidth connection is detected. When connecting to multiple cameras at multiple remote sites, the VPC will create a thumbnail for each viewed camera of each remote location. The users can assign these thumbnails one of six available colors for easier future identification. Such color-tagging combined with thumbnail identification help improve and speed up search and video viewing by the user. Servers can be sorted into custom groups, while channels can be arranged into Favorites folders, for convenience and faster access. VPC search and backup capabilities are simplified to meet the resource demands of multiple site and camera connections. Once connected to the remote location, users can perform a historical search or create a backup of the video onto their local storage media. Similarly, to view cameras, a thumbnail image is created for each backed up video clip for ease of reference. VPC allows importing custom facility maps and laying out available cameras on the map by their physical installation locations. Facility maps help users identify where the cameras are located and simplify viewing cameras in the direct vicinity. Cameras positioned closely to each other on the map, are automatically linked by the software and are displayed together, which provides the user with the ability to track the subject throughout the facility.